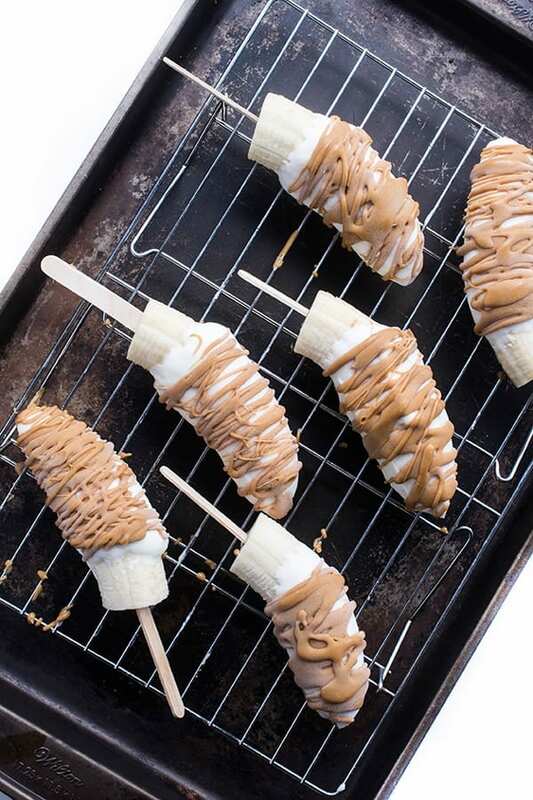 A healthy and easy dessert recipe made with three simple ingredients, these frozen banana pops are coated in Greek yogurt and drizzled with peanut butter. You know it’s summer vacation when the temps start to climb and the ice cream trucks are chiming in the neighborhood every night. Much to my boys’ dismay, we don’t hail the driver over as regularly as they wish but that doesn’t mean we don’t get to enjoy frozen treats. 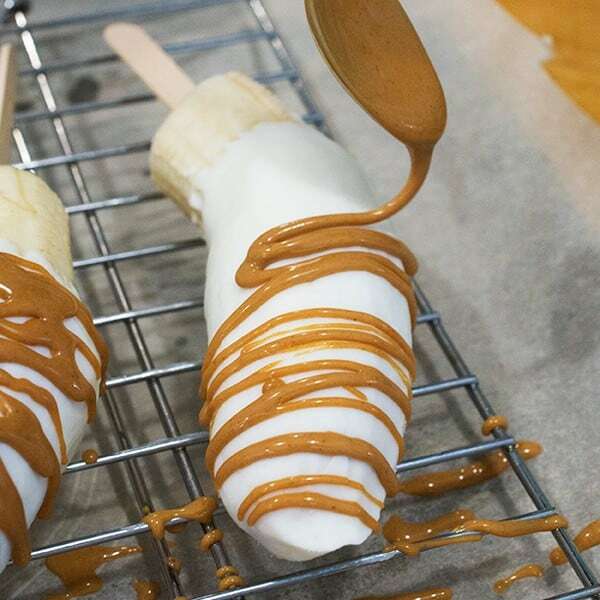 Instead of relying on the overly priced, highly processed packaged treats, we love making our own homemade frozen banana pops dipped in vanilla Greek yogurt and drizzled with creamy peanut butter. Made with just three simple ingredients, this frozen sweet treat is healthy enough to eat for breakfast or an afternoon snack. Protein packed Greek yogurt, nutrient-rich bananas and creamy natural peanut butter provide the perfect balance of energy without the usual post-ice-cream-truck sugar crash. Ideal for making ahead of time, simply wrap each one individually in plastic wrap, stash in the freezer and enjoy for up to three months. The best part? 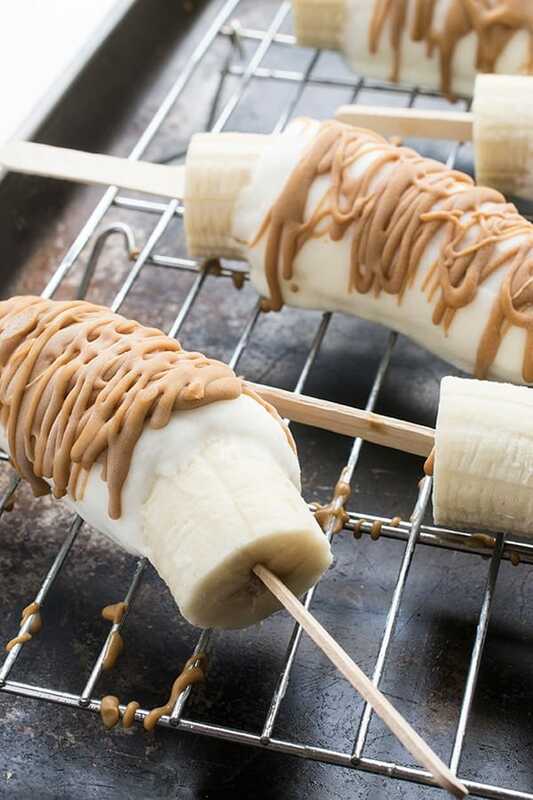 You don’t need to have any cash on hand or chase a truck down the street to enjoy these frozen banana pops. Cut each banana in half and carefully insert the bottom of each with a wooden popsicle stick, about 1/3 of the way into the banana. Place bananas on a large baking sheet lined with parchment paper. Freeze bananas until partially frozen, about 30 minutes. Place the vanilla yogurt in a tall pint glass and carefully dip each partially frozen banana into the yogurt to coat leaving 1/2 inch at the bottom of the banana uncoated with yogurt. Line yogurt-coated bananas back on the parchment paper and freeze until completely firm, about 1 hour. Next, microwave the peanut butter until smooth and creamy, about 30-45 seconds. 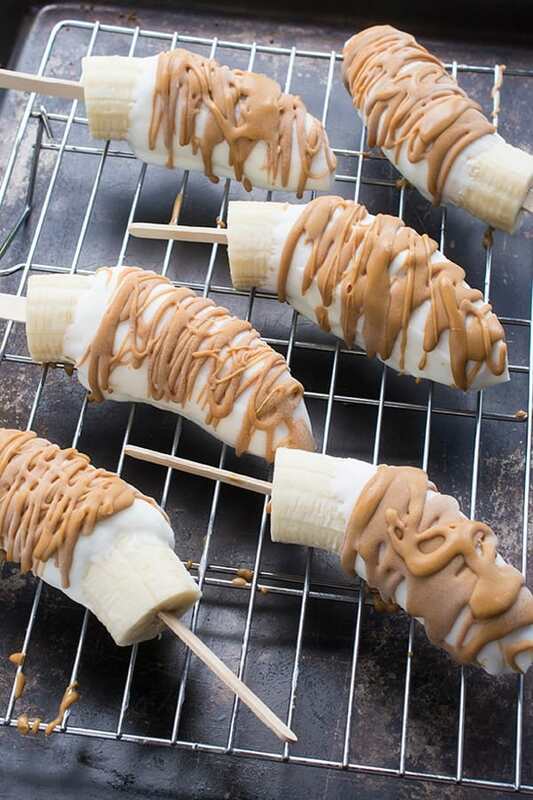 Drizzle peanut butter evenly over frozen yogurt coated bananas then place on the baking sheet to freeze once last time. Freeze until peanut butter is firm, about 30 minutes. Enjoy immediately or wrap each banana in plastic wrap and store in freezer for up to 3 months. Disclosure: I am honored to be a Milk Means More Dairy Ambassador. Thank you for supporting the brands that make The Lemon Bowl possible. All thoughts are my own. For more great gluten free recipes, check out my Pinterest board! 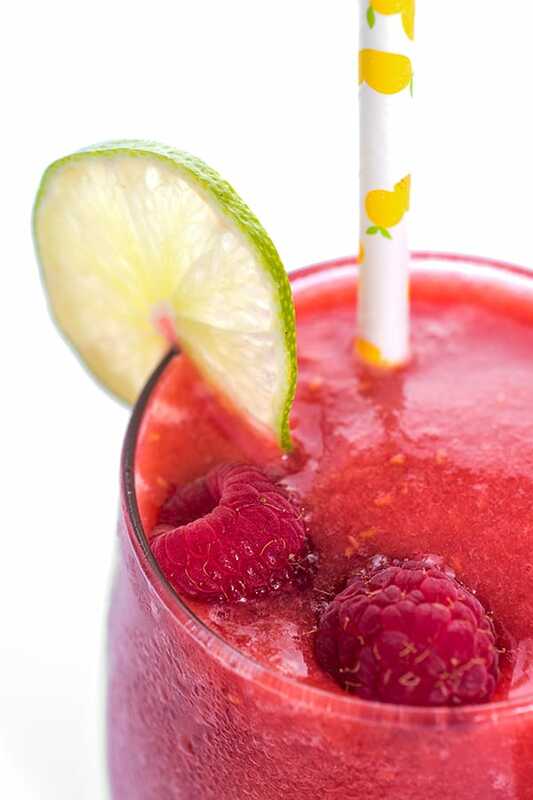 Oh my gosh, I love this easy, healthy idea!! I couldn’t believe how easy they were!! I am totally going to try this! What a great after dinner snack. They are so good and perfect for beating the heat!! These banana pops are just the thing I need to keep around my sweet treat cravings! They are perfect for beating a sweet tooth craving! You need these to beat the heat lady! I definitely need to make these for my kids! My kids ate these for week!! So good and last well! I must make this…now!!! I bet chocolate Greek yogurt enhanced by PB2 chocolate peanut butter would be yummy. So funny I almost did chocolate yogurt! I think that will be next! What a great idea! I’d probably like them better with chocolate rather than peanut butter. I love that these would be naturally sweet and they wouldn’t have an overwhelming amount of sugar the way commercial ice cream does. Yes chocolate is a great idea – I think I’m going to try that next! They were surprisingly easy to make!! !